Brush and tree debris will be chipped. Dump site for Recyclables, E-Waste and tires: SHOW, INC., 224-7214, Accepted Items: Newspapers, cardboard, phone books, magazines, office shred, tires with or without rims, motor oil, batteries, E-waste, and all recyclable items such as aluminum, plastic bottles, detergent bottles, and milk jugs. Non-Accepted Items: Oil based paint, pesticides, shingles, drywall, concrete, asbestos products or Hazardous Waste. No commercial trash of any kind will be accepted. This includes all contractors. Sponsored by Pride in Sapulpa, Sapulpa Chamber of Commerce, Waste Management, City of Sapulpa and the Great American Cleanup Oklahoma. 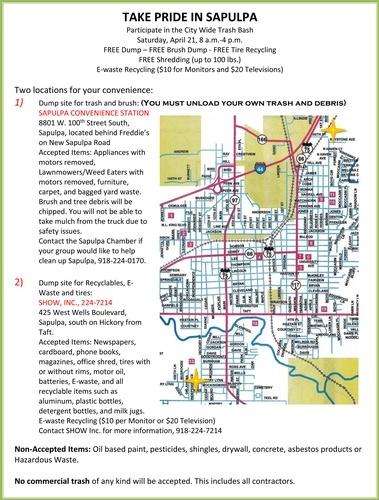 Dump site for Recyclables, E-Waste and tires: SHOW, INC., 224-7214, 425 West Wells Boulevard, Sapulpa, south on Hickory from Taft. Saturday, Oct. 20, 8 a.m.-4 p.m.
Free for brush, household items, recyclables, etc.